You’ve done it. You’ve committed to purchasing a shipping container (or several of them) and have the perfect place in mind to set it up and start your build. Now it’s time to think through the logistics of the delivery and offloading of your container. How much clearance do you have around your proposed site? Is there tree cover or other overhead obstructions? Is the ground flat, or will the containers ‘bridge’ over some of the terrain? These questions and others are important to think through and discuss with your delivery agent. Depending on the company, there may be a few different options available to you that can affect the cost and final position of your containers. Let’s talk through some of the different ways shipping containers may be delivered to you, and discuss some things to be aware of for each of them. The most common way of offloading a container is to slide it off the back of a truck or trailer. The vehicle will have a hydraulically actuated tilt bed, and after reaching the correct angle, friction will no longer hold the container in place and it will start to slide off the back until the corner of the container hits the ground. A skilled driver will then slowly drive the truck forward, letting the front of the container slide further down the tilt bed until it is resting on the ground. Ground Surface: The truck/trailer has to back up to where the back of the container will sit, so you’ll need a flat surface for it to drive on. The slide off method is best suited for placing containers on the ground or a slab foundation, not onto piles or a perimeter foundation. Overhead Clearance: The trailer’s tilt bed will raise the front of the container 20 feet or more in the air, so you can’t have any overhead obstructions (trees, wires, etc.). Front Clearance: If you have a 20-foot long truck and a 40-foot long trailer, the front of the truck will be 60 feet in front of the container before the container has completely slid off and is on the ground. Then the truck/trailer needs additional room to turn/maneuver and exit the site (This depends on your site configuration, but keep in mind that these large trucks can’t make sharp turns). This means that one end of your container needs to have a long/flat/straight/unobstructed approach. Vertical stacking: There is no way to stack containers that are delivered via tilt bed. If your design includes any stacked containers, you’ll have to arrange for another piece of equipment to do the actual container stacking. Another option is a truck that has a side loading device. This enables the truck to pull up beside your foundation area and offload the container directly off the side. Ground Surface: The truck/trailer needs to have a flat approach on one of the long sides of your container foundation area, and will also have to deploy hydraulic outriggers to keep from tipping over. These outriggers will extend from the side of the front and back of the vehicle, so make sure you have room for them. Overhead Clearance: The side loader will typically pick the container up a bit before dropping it down on the ground, so you’ll need to watch out for overhead obstructions. Vertical stacking: Many side loaders can stack containers, but only a maximum of two containers high. Due to their limited reach and the presence of the outriggers, stacking is typically limited to one container directly on another…no offset or perpendicular stacking. The average forklift you see in a warehouse isn’t able to pick up a container, but there are some larger models that can handle the weight. In most cases, you’ll need a “rough terrain” model (like this one), as your building site will not accommodate a forklift made for smooth concrete floors. Piggyback: Some forklifts are designed to attach to the back of a trailer using their forks (meaning the full length of the trailer is still available to hold the container). However, most models don’t support this. Of those that do, we only know of forklifts with the capacity to lift a 20 ft container at most, as even the largest piggyback forklifts max out at around 8000 pounds of capacity. Separately trucked: If the forklift can’t piggyback, it will have to show up on site via a separate vehicle from the one carrying the container. Ground Surface: The truck/trailer can park pretty much anywhere on site, but you want to minimize the distance the forklift must travel from the truck to the container foundation. Keep in mind that while your site doesn’t need to be glass smooth, any large ruts, hills, ravines, etc. will prevent a challenge for the forklift when loaded down with the container. Overhead Clearance: A forklift can place a container with minimal overhead clearance, so trees and power lines are less of a concern with this option. Weight: Only some of the largest model forklifts are able to carry a container, especially a 40ft one. If you outfit your containers offsite with walls, insulation, etc., you’re greatly adding to the weight. In this case, you’ll want to speak with the delivery company to see if they have the capacity to handle a loaded container. It may be helpful to keep a tally of the weight of everything you place in the container so you can discuss this with the company. Vertical stacking: Depending on the forklift model, you should be able to stack one or two containers on top of the base container. Most stacking configurations are possible with forklifts, assuming you have a flat area on the ground to allow for it. 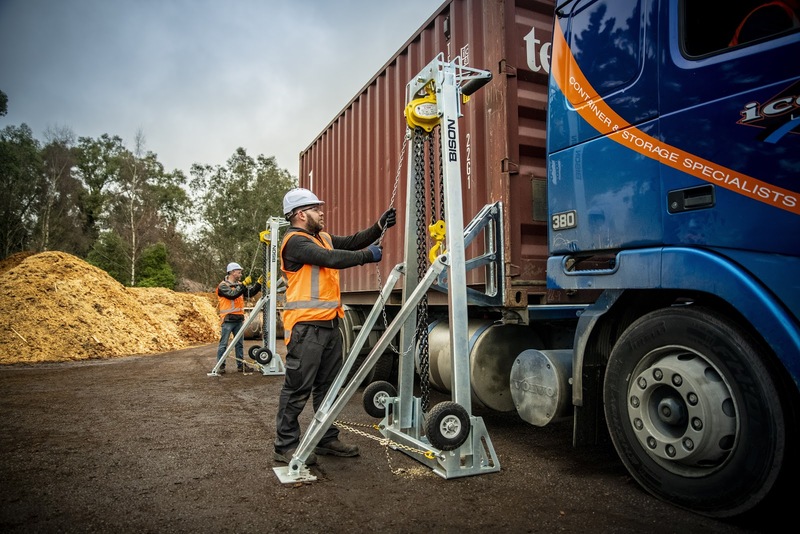 Another interesting offloading method is the hydraulic lift jack, where the container (with the aid of removable hydraulic legs) picks itself up off a trailer, then lowers itself to the ground after the trailer drives away. Note that this method does not allow for moving the container horizontally. The container just goes straight down from where it sat on the trailer. Ground Surface: The truck/trailer will need a smooth approach, and this is also where the container will sit. Having a level surface is paramount unless you have blocks for the container to sit on. Weight: Depending on the model, some jacks may have trouble will a fully loaded/converted container, so check with your supplier. An empty container is no problem. Vertical stacking: As jacks don’t allow for horizontal movement of the containers after they are elevated, there is no way to use jacks for vertical container stacking. An option that’s very similar to the hydraulic lift jack is the mechanical lifting jack. It effectively does the same thing, but instead of using electricity to power a hydraulic pump that actuates a hydraulic cylinder, the power comes from you! Specifically, you manually actuate a chain hoist to lift and lower the container. This makes the mechanical option simpler and cheaper than the hydraulic alternative, with the downside of being slower. But if you’re not moving containers every single day, it might be an option to think about. A crane is what many people commonly associate with container offloading. They offer a lot of flexibility but can be expensive to have on site, especially if you aren’t near a major city. The crane itself is a vehicle, and an additional truck/trailer will be needed to separately transport the container. For a build with one container, this may not be cost-effective, but with more containers, the impact is lessened. Ground Surface: A crane is the one option that can place a container onto the side of a hill or other very uneven terrain (assuming an adequate and level foundation is available to place the container one). The crane itself will need a flat area to setup and deploy its outriggers. Overhead Clearance: A crane will have the most trouble with overhead obstructions of almost any option presented in this article. If your build has a lot of tree cover or other obstructions, you might want to consider other options. Weight: Cranes come in a variety of capacities, but if adequately sized, they’ll have no trouble with a shipping container (full or empty). Note that crane capacity is a function of not only the weight it can hold, but also the horizontal distance from the crane that this weight must be carried. Depending on your design, this could impact the size of crane needed for your built, so be sure to discuss this carefully with the crane operator before they come on site. Vertical stacking – Cranes offer the greatest potential for stacking of all offloading options, and can handle all stacking configurations. A truck mounted crane offers many of the benefits of a regular crane, but without having to transport the crane separately from the container. The truck-mounted crane is smaller than a regular crane, so some capabilities will be reduced. The majority of truck-mounted cranes can only transport 20ft containers on the truck due to overall length. 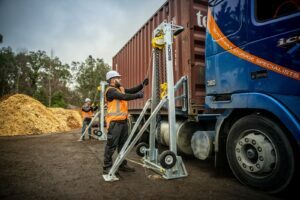 The benefits of truck-mounted cranes are reduced as more containers are used in your build, and a traditional crane or other offloading option may make more sense. Ground Surface: The truck needs a flat spot to park and deploy its outriggers. As the crane is smaller, the parking area will need be closer to the container site. Overhead Clearance: The same issues with a traditional crane apply. Weight: Some truck mounted cranes can only handle 20 foot containers, while others can lift larger models. You’ll have to talk with the operator to determine if a full container is within the crane’s capacity. As with traditional cranes, the capacity of the crane is a function of both the carried weight and the horizontal distance from the crane that the weight must be placed. Vertical stacking: Truck mounted cranes can accommodate stacking, although with their shorter booms, the configurations are more limited. You’ll need to speak with the operator as you jointly develop a lifting plan to see if your build configuration can be accommodated. There are several great choices on how to place your containers on site, but they don’t all work equally well for every situation. It’s important to have an understanding of the various options and their pros and cons in order to have a successful build. Regardless of which method you and your delivery company go with, you need to plan how the equipment will maneuver on the site long before it ever arrives. If your building site is in a flat field, you won’t have too much trouble. But if your site includes other buildings, creeks, trees, hills, etc. you’ll need to carefully think through how vehicles and equipment will enter, move around, and leave your site. Especially when multiple containers are involved, it can be an intricate ‘dance’ to get everything arranged in the right way for successful offloading. It’s also important to remember that the road you use to access the site with your personal vehicle may not be adequate for the heavy trucks that will deliver your container, so ensure you discuss this with the delivery company if you only have a dirt road. Anything we’ve left off? Good (or bad) experience using one of these methods? Let us know in the comments!